Preheat oven to 350 degrees. Cream shortening, sugars and peanut butter; stir in egg. Sift flour and baking soda together and mix into peanut butter mixture. Roll 1 tsp. dough into a ball and place on ungreased cookie sheet. Repeat with the rest of dough. Press each cookie flat with a fork in a crisscross pattern. Bake until edges are lightly browned, about 10 minutes. This dough spreads out so don't crowd the dough on the cookie sheet. This is a smaller recipe so sometimes we double it, if we are wanting to share with friends or neighbors. These cookies are very additive so enjoy! There is only one day left to enter my give-a-way. Leave a comment telling your favorite grilled food. Have a great weekend! Nice to munch on , i love them! The power of suggestion is such an awful thing :) I will not be able to stop thinking about these cookies until I make them...they look delicious and I'm a huge sucker for cookies! Lynda, you are reading my mind. I have been madly craving peanut butter cookies but wanted a really terrific tried and true recipe. I'm going to make these this coming week. 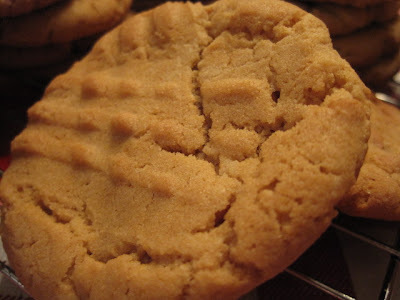 Peanut butter cookies are in my top five favorites!!! Bless you for this post!! How cute that your daughter made them and took pictures of them! They sound perfect! I'm sure if I'll try I'll love them too! Look really yummy! WOW! crispy on the outside and soft and chewy on the inside? they're perfect PB cookies! mmm! Peanut butter cookies are my all time favorite!! yum! love peanut butter cookies! something about those fork marks always makes me smile! 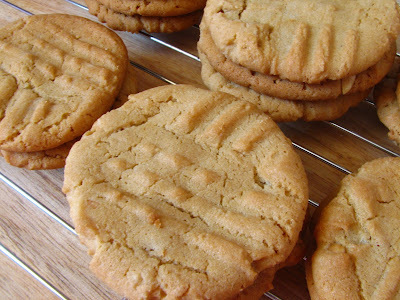 well, they look like the quintessential peanut butter cookie to me, from the thickness to the telltale criss-cross. great recipe! Is it possible to substitute the shortening with something else?